Electricity is a challenging concept to teach. Concepts like potential difference and current are incredibly abstract – these ideas are novel and not easily linked to the concrete world. Secondly, many concepts go against children’s naive ideas e.g. current is used up when it passes through a component. It is important that ideas are introduced with real caution and that the ideas of current, voltage and energy are dealt with separately first (Driver et al., 1994). Current is the flow of charge. Voltage (or better still potential difference) is needed for current to flow and is best introduced first as a property of an isolated battery; note that a voltage can be present even when no current is flowing. Current transfers energy around the circuit from the battery to various components (resistors). At resistors the electrical energy is transferred into other forms. This analogy model below will help consolidate understanding around the concepts of current, voltage and electrical energy. As with all analogies, there are limitations and it’s best to use more than one. The light bulb challenge. 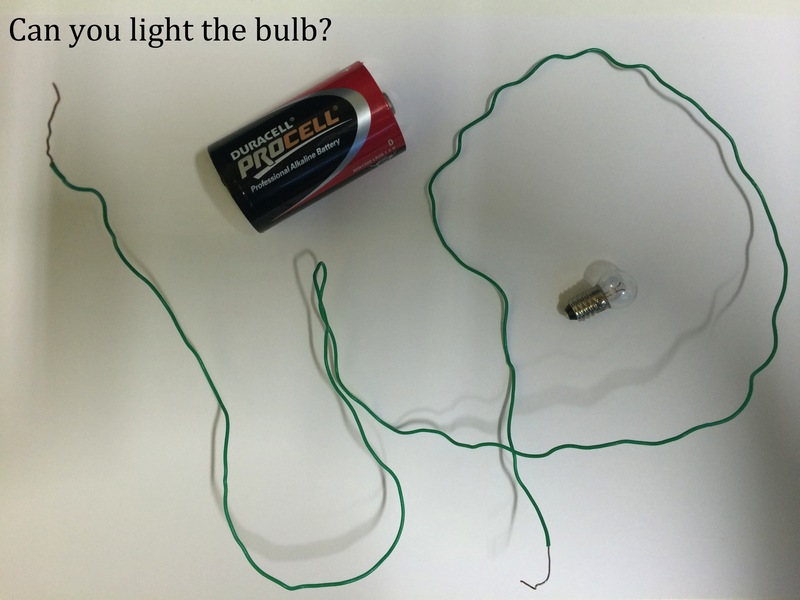 Ask students to light a bulb using only a wire and a battery. This simple activity often challenges students – many think it is impossible to do with only one wire! It would be an excellent way to introduce the topic on electrical circuits. Click on this link to see how MIT graduates coped with this science challenge. The electric sausage is a great demonstration to introduce electric fields and static charges. This is a fantastic tool to draw circuit diagrams using a computer. Try the energy stick with your classes. A great way to investigate current, conductors and resistance. Or see how two different kinds of homemade play dough can be used to demonstrate electrical properties — by lighting up LEDs, spinning motors, and turning little kids into circuit designers. 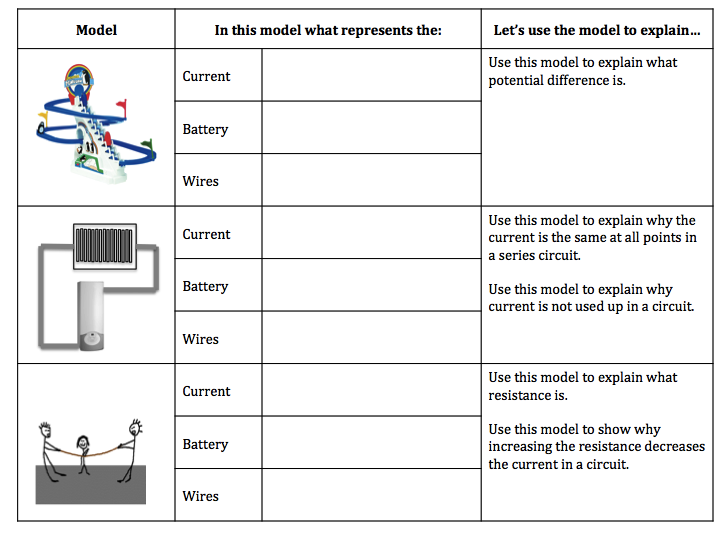 A great resource from the IOP using a model to explain current, voltage and resistance in series and parallel circuits. This fantastic Phet animation provides a great starting point to begin thinking about charge, conductors, current and energy before electrical circuits are introduced. Explain how pollen sticks to bees using static electricity.